Rehabilitation is increasingly being used as a conservation management tool for endangered species like the yellow-eyed penguin. Hoiho that are injured, underweight or diseased are often brought into rehabilitation facilities to be treated and nursed back to health. Sometimes birds require veterinary care prior to rehab for lacerations and wounds, and to reduce complications from infections of the tendons, joints and bones. Vetlife in Oamaru, St Kilda Vet Centre in Dunedin and the Dunedin Wildlife Hospital Trust provide this specialist support. The Yellow-eyed Penguin Trust works closely with penguin rehabilitation centres in the South Island. 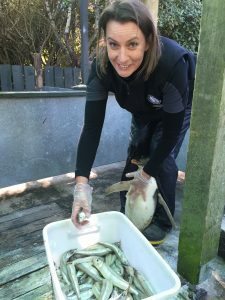 There are three facilities for hoiho in Otago (Penguin Place, Penguin Rescue and Oamaru Blue Penguin Colony) and one in Canterbury (Christchurch Penguin Rehab). No such facilities exist in the Catlins or Stewart Island (Southland). Rehabilitation efforts are said to be successful if a penguin goes on to survive and breed.